Easy to use and install, has a long service life. It needs DIY and can improve your hands-on ability. Power delay output protection, no impact on the sound, protecting expensive speaker. Large output power, low distortion and high sound reproduction. No noise disturbs the current sound. Support DC 24V single power supply, or 18V AC power supply (requires additional rectification and filtering circuit), dual power supply mode. 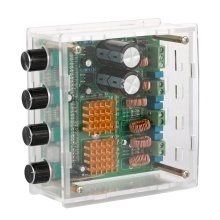 A variety of audio input methods, onboard BT receiver module, or input audio from 3P socket, can meet the connection of different modules. Support super bass cutoff frequency adjustment (cutoff range is 180Hz-250Hz). Designed of anti-reverse circuit to avoid damage to the power amplifier board due to improper use or reverse polarity of power supply.